Police forces in the UK face an increasing challenge in finding more efficient ways to fight crime as the number of police officers dropped14% over the last seven years. In addition,police departments have different requirements across the country. For instance, in large cities like London, police stations are densely situated to ensure timely dispatches to crime scenes; but in rural areas, police resources are more spread out. Officers often need to travel greater distances to support an incident, and this needs to change. This is a situation faced by Devon & Cornwall Police and Dorset Police – collectively the largest geographical police entity in England and Wales1. Officers at D&C and Dorset face many types of incidents that range from supporting vulnerable persons to dealing with serious and organized crime. The situations often involvepeople who might harm themselves or others, and the end goal is always to minimise the risk to all parties involved and bring the incident to a safe conclusion. The Mavic 2 Enterprise can be especially helpful to the police department in achieving this goal. D&C and Dorset were among the first to discover the benefit of deploying drones, which were usedin standard operations since 2017. The two departments formed an alliance in 2016 to provide mutual support in equipment, expertise and pilots. “Deploying drones for operations has proved to be a perfect way to gather information and intelligence about the incident the team may be facing”, says James Rees, the Sergeant who leads the Alliance Drone Team. It is important to contain the crime scene. Gathering intelligence on the premises and the suspect’s movements is crucial to minimising risk for the public and the subject while maximising the safety of the officers. Aerial imaging from drones like the Mavic 2 Enterprise can help identify the location of the suspect and then evaluate the risk level when the crime scene needs to be scouted from a distance due to safety or tactical reasons. During an operation, there are many critical pieces of information that can be put together with the help of drone imagery and data. For example, determining the presence of civilians within a given area, the exact location of the subject and whether he or she is armed – or even spotting an escape route or vehicle nearby. Rees points out that these insights enhance the effectiveness of deployment and tactics plans. When arriving at the scene, officers would want the drone to be in action immediately to support the operation. The Mavic 2 Enterprise checks all the boxes: its ultra-compact and foldable design means it is ready to go within minutes. Its total weight including the modular accessory remains about 2lbs (less than 1 kg). In order to protect the public, the officers often have to set up a containment area around the incident in question. A visual containment can be the first step, and the new Mavic 2 Enterprise can help officers achieve this. 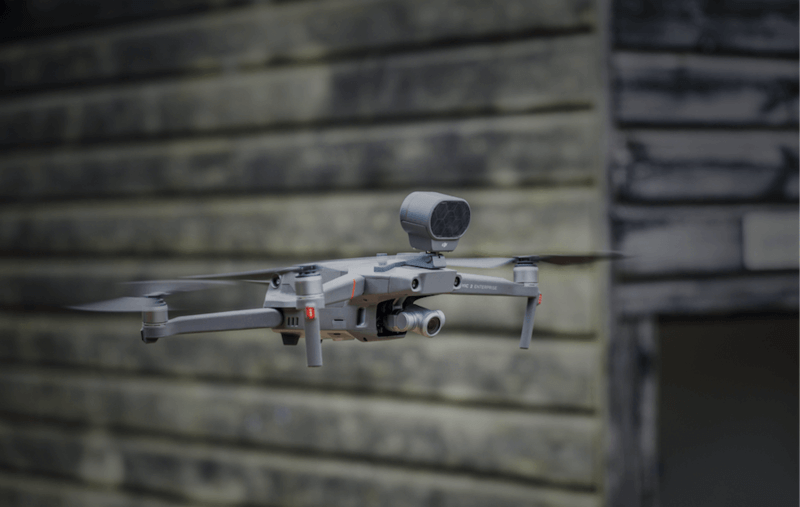 Equipped with a set of new low noise propellers and a dynamic zoom camera, drone deployment is swift and unobtrusive,allowing officers to capture detailed images of the scene without flying any closer. Rees comments on this by saying: “it makes a difference in operational decision making to know if the subject has immediate access to a weapon”. Sometimes the drone needs to operate in close proximity to buildings and vegetation. As the pilot focuses on the flight path to acquire aerial data, the Omnidirectional Obstacle Sensing system of the Mavic 2 Enterprise provides support by preventing collisions and keeping a safe distance from buildings, trees and other surrounding objects. The footage obtained from the drone will sometimes be required for legal purposes after the operation concludes. The GPS timestamp is a new feature which supports post-incident analyses. The stamps are integrated in both pictures and videos and provide information about the location and time sequence, which helps officials retrace details of the incident. As these cannot be altered, the police are able to prove that the data has not been tampered with. Going hand in hand with this security measure is the new password protection of the Mavic 2 Enterprise. 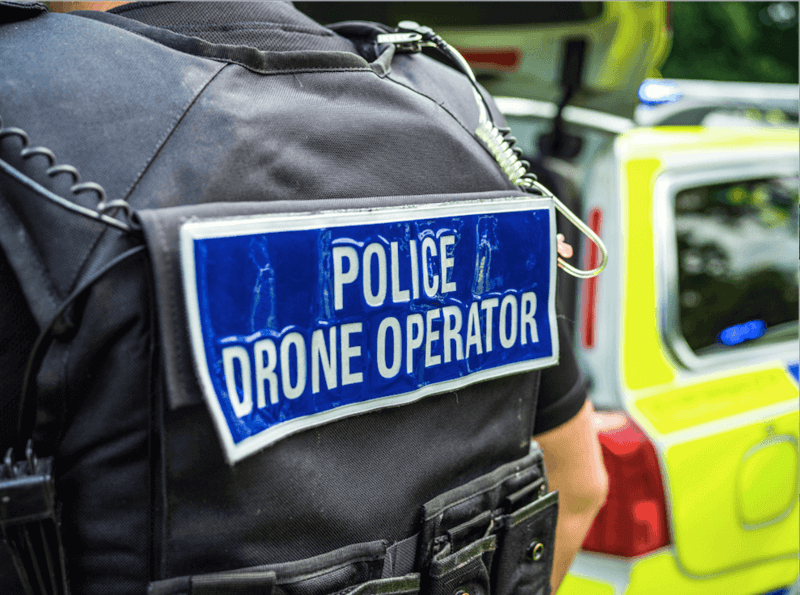 As data security is a sensitive matter for police work, the request to enter a password in order to take off or access the 24 GB on-board storage assures that the data stays safe even if the drone falls into the wrong hands. 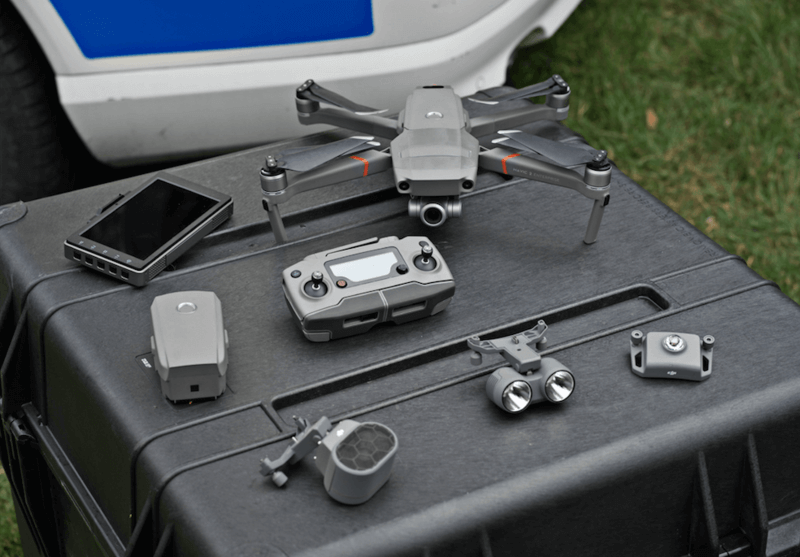 According to Rees’ colleagues Ricky Fidler, Dorset Police Chief Pilot, and Tom Shainberg, Devon & Cornwall Police Chief Pilot, both Alliance Operations Department, the new modular accessories on the Mavic 2 Enterprise were the most innovative features. Containment incidents by nature often happen in low light conditions, defined by the time of day, weather, or infrastructure. The drone is equipped with a bright spotlight which assists officers operating in low light scenarios. The benefit speaks for itself, as previously, operations werejeopardized or halted due to the risky and unclear nature of the environment. 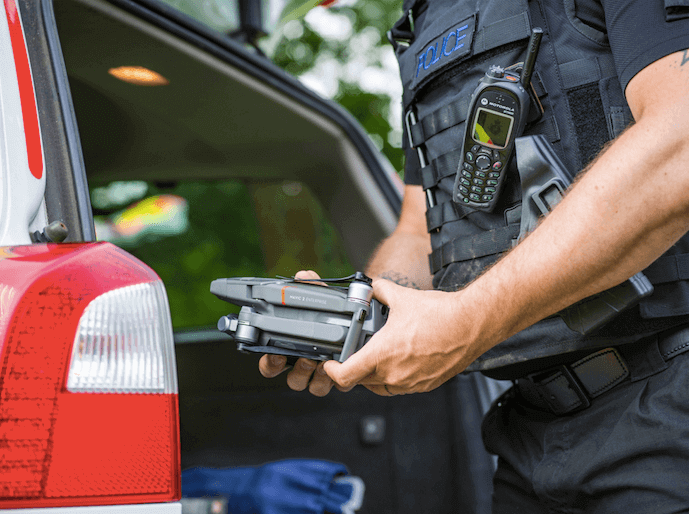 The attachable speaker is a new accessory that helps officers communicate with each other more effectively at the scene, and for the first time ever, allows the officers to communicate with subjects across a wide variety of police incidents. In a containment situation, the speaker might be used to address the subject and prompt a surrender. In other scenarios, the speaker can be an invaluable tool for addressing and reassuring injured people in rescue operations or overseeing large crowds of people at gatherings like concerts or demonstrations.